One of my main concepts with the [“This is Your God” show in 2003 at the Six Space Gallery in Los Angeles] (and the campaign as a whole) was that obedience is the most valuable currency. People rarely consider how much power they sacrifice by blindly following a self-serving corporation’s marketing agenda, and how their spending habits reflect the direction i which they choose to transfer power. At least the irony of the situation isn’t lost on one of us. 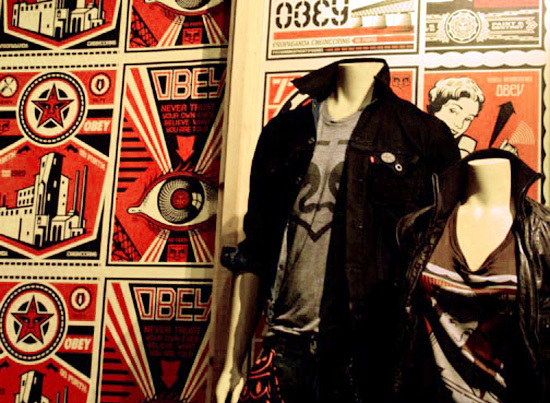 This entry was posted in illustration, street and tagged levis, sellout, shepardfairey on November 7, 2009 by jonathan. I’ve been thinking more about solar plants recently. I like how these projects combine both form and function. I’ve been thinking about what I’d like in one of these, and how one would be made. First, the power being collected by the solar cells needs to go somewhere. It could just feed back into the device, which is exactly what happens with plants, but part of me likes the idea of having the sculpture(?) have a practical use as well. If I want practicality, then USB ports for charging an iPod or a phone that I don’t have would be nice. At least one port, but four would be more than plenty. I’m leaning towards the solar cells charging some li-ion or nicad battery coupled with something like a Minty Boost. The second feature I’ve been hammering the previous electronic plants I’ve looked at is the movement, specifically heliotropism (i.e. sun tracking). It’s an interesting feature, and it would increase the power to the photovoltaics. I don’t like the idea of the hearing servos move, so that means nitinol wires, which also have the quality of more closely resembling natural motion by simply expanding and contracting. The next question then becomes, what form would the motion would take? If rigid photovoltaics are used, then panel could be mounted to a universal joint with the two outside corners independently controlled by nitinol. The other idea is to use flexible photovoltaics and hopefully no hinges and joints. Another interesting idea is to think about deployable structures, which would seem to imply the use of flexible photovoltaics. It’s not exactly the heliotropism I was thinking of, but it would be cool if the “leaves” opened up in the day, tracked the light, and then closed at night. Will I actually build this? Probably not, but it is something I’ve been thinking about. Perhaps it would give me an excuse to visit Noisebridge. This entry was posted in installation / sculpture, personal, tech and tagged deployablestructures, make, nitinol, plants, solar, usb on November 6, 2009 by jonathan. 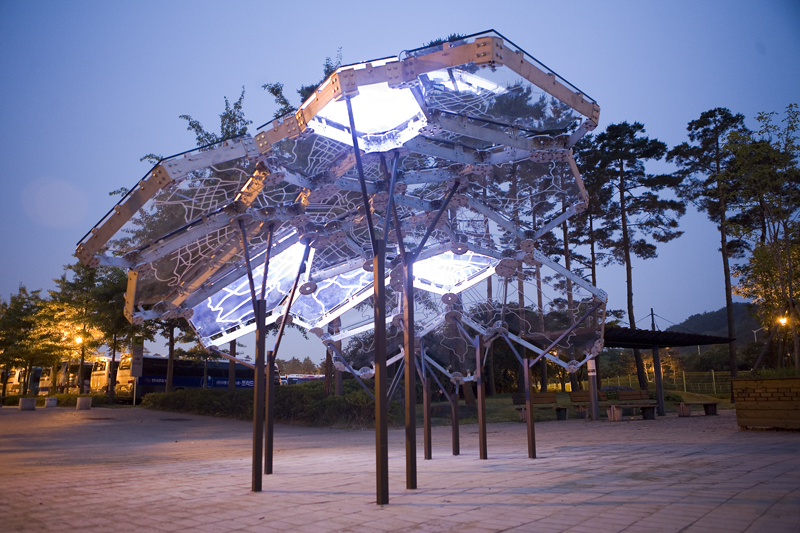 Taking a commission from Seoul’s City Gallery Project, The Living created Living Light, a vaguely forest-like structure that features a map of Seoul across the canopy. Each of the 27 panels in the canopy represents a particular neighborhood in the city. At night, each panel is illuminated based on air quality data as measured by various sensors throughout the city. Every 15 minutes, the panels turn on in the order of best quality to the worst. This entry was posted in installation / sculpture, street, tech and tagged environment, plants, seoul, theliving on November 6, 2009 by jonathan.